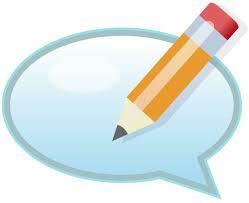 The result of my search is the PHP IDE plugin for Visual Studio by Jcx.Software Corp. The plugin installer after installtation automatically adds php code completes feature into visual studio and some php project templates. The installer can be downloaded from http://www.jcxsoftware.com/ It comes with a paid license, but you can download the software and try it for 30 days. 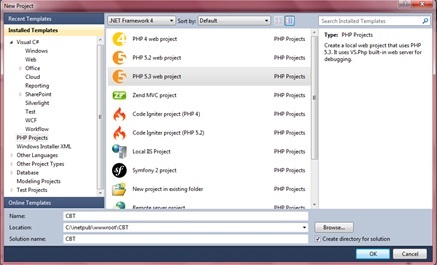 After a successful installation, if you try to create a new project in Visual Studio, you will notice that PHP project templates have been added to visual studio project templates dialog. 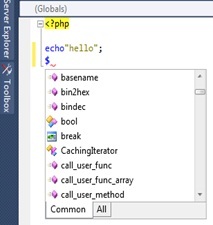 Thus, you can write your php codes from visual studio with full intellisense support. Though the plugin from Jcx.Software comes with a web server that you can use to debug your PHP applications, I wanted to use XAMPP server or IIS. But on installing XAMPP server it kept competing with IIS on port 80, each time I developed a PHP application, I had to stop IIS for XAMPP to work. So, I decided to disable XAMPP and configure the IIS to serve Php pages through CGI. 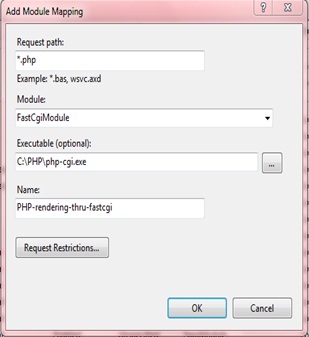 Configuring IIS to serve PHP pages could be achieved by first downloading the PHP 5.4 Non thread safe zip file from http://windows.php.net/download and then extract the content to a folder on your computer, then a handler mapping need to be added to IIS. To do this, open the IIS manager by clicking the Windows Start Menu button, then select Run and type "inetmgr" and click ok. This will open the IIS manager interface. In the Connections pane, at the top left side, select your server node and double click Handler Mapping. In the action pane, at the top right side click "Add Module Mapping..."
This will bring a dialog box, in the Request path textbox type *.php, the, then select the module dropdown box and select FastCgiModule, In the executable section, click the button to browse to the folder that contains the extracted files of the php 5.4 that you downloaded to select php-cgi.exe. . In the Name textbox, you can type in any name of your choice, then click the "Request Restrictions" button to configure the mapping to invoke handler only if request is mapped to a file or a folder and then Click ok to create the handler mapping. Thus, you can build PHP applications from Visual Studio with IIS as the web server. Yeah the free addin VS.PHP unit is cool but it has limited features, but I have used the addin from Jcx.Software Corp, it provides much more advance futures for it price.